I have been sitting on government selection panels since 2003. This has not been an every now and then occurrence – it is my job to sit on selection panels, it’s all I do! Not only has this given me a great insight into how applicants approach their job applications, but also how selection panels assess these applications. I have also been involved in training selection panel members and recruitment delegates. This has lead to some very interesting discoveries. Before I expand to tell you how to make your selection criteria answers better than everyone else's, I want to explain to you HOW your application is assessed. Please don't skip over this bit, it's very important (probably more important than what you will read later) and why it is important will become very clear soon. When panel members look through the applications they have received for an advertised job, they go through a process. Experienced panel members typically use an elimination process, narrowing applications down and then honing in on the best ones. So the first time they see your application is when they are going through a culling process and eliminating the worst applications. They will be assessing every application and looking for reasons to eliminate it from the recruitment process. Let me say that again. When the selection panel are reading your selection criteria, they will be looking for reasons to eliminate you from the process. missing education and training details or any other information that they would like clarification on, that you haven't provided in your application. Let's be really clear here. If there are gaps, inconsistencies or missing pieces of information in your application, they selection panel are NOT going to ring you to ask you for more information. They are just going to put your application in the 'NO' pile. The first key for writing great selection criteria answers then, is to make sure your criteria address any objections that may come up. If there is any reason or thing that brings the quality of your application down, you need to identify it and eliminate it. Your whole application, your cover letter, resume and selection criteria need to be written and compiled in a way that makes it really easy for the selection panel to understand who you are and what you can offer without confusion or questions. In his book “Employer Secrets” Phil Baker outlines the one key thing you need to keep in mind when you’re applying for a job. You are the service or product. The employer is the customer. Your cover letter, resume and selection criteria answers are your advertising, you are the product, the interview is your product demonstration and the employer is going to buy (pay for) your product. However, the employer has lots of products to choose from and you have lots of other advertising messages to compete with. The ultimate goal of your selection criteria (advertising) is to get an appointment to demonstrate your product – get an interview. Imagine you’re going to buy a new high end vacuum cleaner. You put out the word that you’re ready to buy, and a whole heap of vacuum cleaner salesmen offer to come and do an in-home demonstration for you. Of course you’re not going to let 20 random salesmen into your home, you’re going to pick the vacuum cleaners that you think are most likely going to meet your needs. You’ll look at their features and benefits and technical specifications, and based on your research, maybe pick two or three to have an in-home demonstration. The one that appear to perform the best on the day is probably the vacuum cleaner that you will buy. Applying for a job is exactly the same. You are a product. The employer is the customer. Most applicants get this wrong by focusing in the written application and in their interview on themselves and not knowing what the employer wants or needs. Yes, it is important to make sure you get the right job for you, that you are getting paid what your skills and abilities deserve, that you have opportunities to learn and advance and that you find pleasure in what you do. However, the employer, in a recruitment situation, does not care about any of this. Keep the focus on the employer. 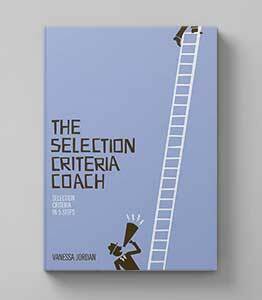 In your selection criteria statements the way to prove that you are the best possible choice for the job is to SHOW the panel that you are the best choice for the job. Therefore, your whole application is going to have to follow the “show, don’t tell” rule. Instead of saying, “I have great communication skills”, show it by providing really smart content on the page, perfect spelling and grammar and a solid persuasive argument. Instead of saying “I am a great presenter, I have presented at lots of conferences” and then listing the papers that you have presented, tell the reader how you engage your audience, what techniques do you have to make your presentation interesting, how do you choose your visual aids and why. I have been to lots of presentations, seminars and conferences in my life, and I can tell you, just because someone is allowed up the front to talk does not mean that they are any good at it and I want to hear them again! Instead of saying that you’re a great graphic designer, use your skills to make your application look wow and the panel’s jaws drop. 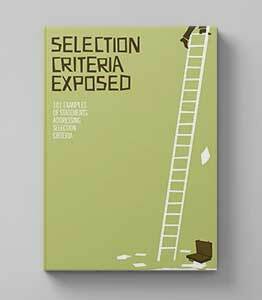 How Do You Make the Panel Take Notice of Your Selection Criteria? Provide quantifiable proof. Statistics, figures, graphs, tables. At the same time, you need to be thinking about weaknesses you have that may become apparent to the reader as they look through your selection criteria answers. You need to be anticipating and stomping down objections. Objections are bricks that build up a wall in the selection panel's mind. Remember from key one, we talked about how the selection panel are looking for reasons NOT to invite you to an interview. Any objection is a reason to put your application in the 'no' pile. One way to overcome and neutralize objections is with incentives. Here is an example of overcoming objections in a sales process (and remember, we have just spoken about how you are essentially the product for sale in the job application process). For example, a woman is at the cosmetics counter looking at a new fragrance, but isn’t quite ready to commit to the purchase. $89 for a new fragrance is a little over her budget. Is it too much to pay for a fragrance? Should I wait for my birthday/Christmas? Do I like it enough to pay that much for it? All of these objections are neutralised by the offer of something more. The incentive. In this case, an incentive that you might see regularly in stores like Myer and David Jones is the free gift with purchase. Worth $145 the gift with purchase is a cosmetics bag filled with beautiful little samples. It comes free with the $89 fragrance, but only for a limited time. And all of a sudden the objections are starting to fall down in the buyer's mind. By writing compelling counter arguments and incentives you will neutralise any objections before the selection panel have even realised they have any. Think of an objection as a brick that makes a wall in the selection panel's mind. When the wall reaches a certain height, it's no longer considered competitive. Think of incentives and counter arguments (or assurances) as rungs in a ladder. The higher your wall, the more rungs your ladder needs to make it over the wall! What Incentives Do You Have? Are you an expert at a certain computer system that you know is used in the job? This is an incentive. Have you done a course that you know people in the work area are doing? This is an incentive. Do you have particular detailed knowledge about legislation that you know will be valued in the job? This is an incentive. Have you plunged into a new job in the past and landed straight on your feet, doing an amazing job (don’t forget proof will be needed if you make a claim like this). This is an incentive. Incentives are not things that everyone has. They are particular strengths that you possess. If you’re writing about the course you have just done in negotiation skills as an incentive, but it’s likely that everyone else applying for the job has also done a course in negotiation skills, then your incentive has just become null and void. And even more than that, if your incentives aren’t strong enough, sometimes they can backfire. For example, you’re watching a late night infomercial for a new vacuum cleaner and the salesman keeps harping on about it’s fantastic feature of being able to remove the vacuum cleaner head so you can use the nozzle to get into tight spaces. The salesman doesn’t leave this feature alone and plugs it long and hard. However, we both know that all vacuum cleaners can do the same thing. And rather than being left thinking about what an amazing vacuum cleaner this must be, you’re left thinking that it must be a cheap and shoddy rip off. The same goes with your incentives. If you take a quick look back at the incentive examples I mentioned above, notice that none of them are impossible to achieve. Anyone can do a computer course, learn and new system, and study legislation. In order to have advanced skills in these areas it will take a lot of time and effort, but if you have your eyes set on a particular job, then it may be worth getting the skills before you apply for the job. 1. You are a product that they selection panel are considering "buying". 2. The selection panel are looking for reasons why they shouldn't "buy you". 3. You need to discover these reasons and come up with counter arguments and incentives that overcome them. 4. If you can do this, your selection criteria answers are going to be strong, targeted, easy to assess and at least 10 times better than everyone else's!